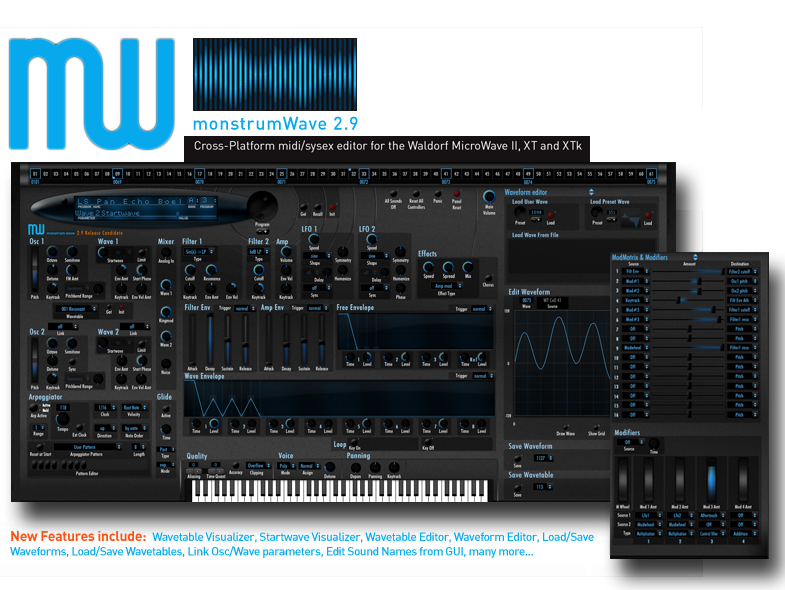 MATRIXSYNTH-P: monstrumWave 2.9 is available now! monstrumWave 2.9 is available now! 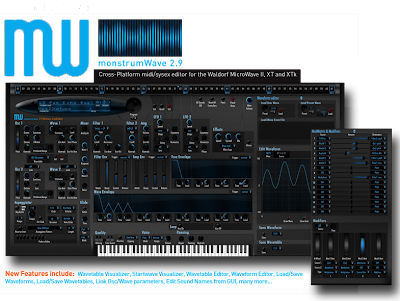 Modern Waldorf Microwave II/XT/XTk standalone editor. Complete with wavetable and waveform editor! Works as a stand-alone editor for mac os (leopard - mt lion), windows (xp-8) and on linux [using wine and a Linux qualified USB/FW MIDI interface]. http://www.monstrummedia.com - 23,423 lines of code for only $66.6. This project has gained massive support from customers since it was initially released as an official product in August of 2012. Customers had faith that I'd deliver on the waveform/wavetable editor. After a period of solid beta-testing from current customers this next revision is prepared for release with still no end in site to future feature adds which all monstrumWave customers receive for free - yep, buy monstrumWave and all future updates come to you at no charge. Selective parameter randomizer which allows you to lock/unlock sections (LFO1, Wave2, Free Env, etc) for randomization. Generate then print or mix Waveform Shapers. Save/Load waveform to binary file. Implemented several feature requests and bug fixes.